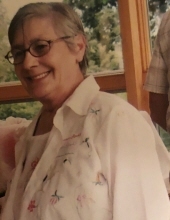 Betty J. Brooks (nee Rosso), age 76, formerly of Skokie and Wheaton, IL, passed away on Saturday, March 23, 2019 at Winfield Woods Healthcare Center in Winfield, IL. She was born December 14, 1942 in Harrisburg, PA.
Beloved mother of Rona, Rosalie, Debbie, Wendy and Michael, adored grandmother of Grace and Sophia, devoted daughter of the late John and Viola, dear sister of Valerie and Carol, fond aunt of Corey. Betty grew up in Chicago and Milwaukee and lived in Whitefish Bay, WI before moving to Illinois. Betty was an avid volunteer for Meals on Wheels. To send flowers or a remembrance gift to the family of Betty J. Brooks, please visit our Tribute Store. "Email Address" would like to share the life celebration of Betty J. Brooks. Click on the "link" to go to share a favorite memory or leave a condolence message for the family.